As far as I’m concerned, one of the unsung culinary combinations in the world is the marriage of pumpkin and peanut butter. (and I probably just lost half of you) Peanut butter spread on toasted pumpkin bread in the morning is a thing of wonder. Something tells me I might lose the rest of you when I try to convince you that this spicy pumpkin and peanut soup is just as good. This soup has a slightly exotic vibe to it even though it contains items that are in my pantry all the time. I came up with this recipe several years ago when I was playing around with a menu that contained ingredients indigenous to the Americas for the whole meal. (What? It’s a hobby.) Pumpkin, peanuts, peppers, allspice – all native to North and South America and were unknown to Eurasians before Columbus’ voyage. (OK, they aren’t 100% sure about peanuts but they think so.) In case you’re curious, the rest of the meal revolved around turkey, potatoes, tomatoes, quinoa, chocolate, vanilla, and cranberries. Almost sounds like a traditional American Thanksgiving, doesn’t it? Cooking with jalapeños is always tricky for me because the heat is never consistent. On one occasion, removing the seeds is required to keep the heat from blowing one’s head off. At another time, the addition of the seeds still doesn’t make it hot enough. I’ve always been told to taste each pepper to forecast its heat – they all taste hot to me like that. Most of the time I just give up and use crushed red pepper flakes because of the Scoville consistency. If I do that in this dish, I find I miss the fruity back notes only derived from fresh peppers, but too much heat drowns out the delicate pumpkin flavor. I can never win. The choice is yours. One note of caution: because this is such a thick combination, the mixture can scorch on the flame if you aren’t careful. A moderate flame and the occasional stir should keep that from happening to you. A bonus to that is that the soup will hold its temperature quite well in a covered pot. So if you’re feeling a little adventurous but don’t want to invest in unusual ingredients, this is the perfect dish for you to try – it’s distinctly American. Hearty and delicious with an exotic twist. Feeling a little adventurous but don’t want to invest in unusual ingredients? Give this soup a try. Preheat soup pot over medium high heat. Add chopped onion, jalapeno, celery, allspice, salt and pepper. Sauté until vegetables are soft, about 5-7 minutes. Add pumpkin puree, stir to combine, and sauté an additional 2 minutes. Stir in bay leaf, chicken stock, and peanut butter. Simmer for 30-40 minutes, stirring often. Just before finishing, add cider vinegar and stir to combine. Ladle into serving bowls and top with sour cream, scallions, and chopped peanuts, if desired. 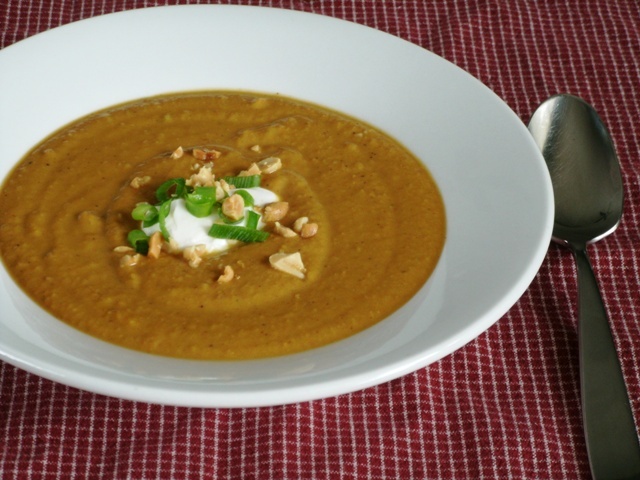 This entry was posted in Cooking and tagged easy, inexpensive, peanut butter, pumpkin, soup, vegetarian. Bookmark the permalink.